This book addresses the question of how knowledge is currently documented, and may soon be documented in the context of what it calls ‘semantic publishing’. This takes two forms: a more narrowly and technically defined ‘semantic web’; as well as a broader notion of semantic publishing. This book examines the ways in which knowledge is represented in journal articles and books. By contrast, it goes on to explore the potential impacts of semantic publishing on academic research and authorship. It sets this in the context of changing knowledge ecologies: the way research is done; the way knowledge is represented and; the modes of knowledge access used by researchers, students and the general public. Chapter 4: What does the digital do to knowledge making? Shifting trends or status quo? Dr Bill Cope is Research Professor in the Department of Educational Policy Studies, University of Illinois, Urbana-Champaign, USA and Director of Common Ground Publishing. He is the co-author or editor of a number of books, including, with Angus Phillips, The Future of the Book in the Digital Age, also published by Chandos, in 2006. Dr Mary Kalantzis is Dean of the College of Education at the University of Illinois, Urbana-Champaign and, with Bill Cope, co-author of The Powers of Literacy, University of Pittsburgh Press, 1993; Multiliteracies: Literacy Learning and the Design of Social Futures, Routledge, 2000; New Learning: Elements of a Science of Education, Cambridge University Press, 2008; and Ubiquitous Learning, University of Illinois Press, 2009. 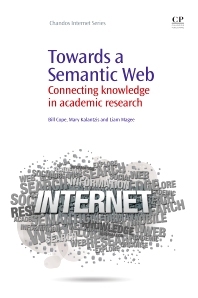 Dr Liam Magee is a research project leader at RMIT University in Melbourne, Australia, working on the theory and practice of the semantic web.